Review: Adam Hills: Mess Around – Assembly @ Assembly Hall, Edinburgh. For those not familiar with Adam Hills’ work, the Spicks & Specks host usually goes to great lengths to craft structured, considered shows and hidden behind the humour, he likes to have a message. However, in past years he has been known to talk to audience members for so long he almost forgets to perform the pre-written show. ‘Mess Around’ is different. Hills takes to the stage with a single observation, a single anecdote, and a single idea to impart on his audience, and works from that moment. Armed with a deep feeling of disgust that 100% of a quiz audience knew the name of Brad Pitt and Angelina Jolie’s firstborn, Hills is out to prove that every night, in every audience, there are people much more interesting than Shiloh Pitt, with their own stories to tell. 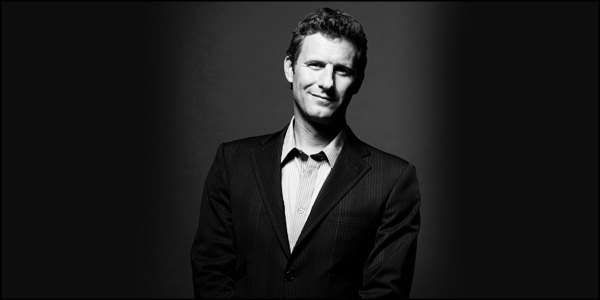 When this improvised show toured in Australia, Adam Hills decided to make somebody famous. He wanted to make Chris Hughes more famous than Shiloh Pitt – and while he may not have achieved that, the pair gathered a 12 year old MC for the gig called Molly, two backing dancers “The Doppelgangers” that looked like Chris, lycra from a marketing manager in the audience, poster designs, a celebrity endorsement from Whoopi Goldberg, and coverage on Triple J radio, The Age newspaper, and Business Review Weekly*. They then stripped in Federation Square, Melbourne, making it around the world on video, and raising over $15,000 to date for the Simon Rhoden Foundation. This time around, there isn’t an audience member to make famous. In Chris’ place, there is Honker. Honker is a stuffed toy originally intended for Hills’ daughter, but has since become the mascot for a campaign to raise money for the Edinburgh Hospital for Sick Kids; a charitable cause suggested on the second night of the run – the night I happened to see the show. With the help of a month’s worth of sold-out audiences, and corporate support from Irn Bru (due to the vast quantities that Adam drinks onstage), Honker has become more famous over the month of August, and has the celebrity endorsement of well-known Scots Biffy Clyro, Ian Rankin, Steven Moffat, and Kevin Bridges. Hills has been blogging the whole story, and fans have set up Facebook and Twitter accounts for Honker. At the time of writing, nearly £5,000 has been raised for the Hospital for sick kids, and you can still donate here. Adam Hills has never been your average Joe Comic, but this show is truly inspiring, truly different, and truly laudable. * Disclosure: This bit is nicked from here.